As you can see, it seems like a very simple game on the surface but it delivers some interesting game play. First of all, players can only place their shiny object on an empty tile (no crows or other shiny objects), so this limits where they can be placed. I like how this reduces the placement choices as it makes for a faster and more informed game decisions. Also, the locations where shiny objects can be placed change every round because most crows move which adds good variety during the game. When the crows fly towards the nearest shiny object, they only move straight along their row or column of tiles. Therefore, it’s possible to attract crows from a long way away if your shiny object is the only one on their row/column and you need to look for these opportunities (as well as spot other players trying to do the same). Crows fly towards the nearest shiny object. Apart from the first player in a round, it’s possible to place your shiny object to attract crows that were going to fly to an opponent’s shiny object. If crows are the same distance away from multiple shiny objects, they will favour one on a tile showing trinkets. If still tied, the crows divide evenly (with any remainder staying put). We found this denial style of play to be an important, and a very fun, element of the gameplay – my groups’ always like this type of screwage. After scoring, if there are 6+ crows on the same tile, they scatter. The player removes 2, leaves 1 on the tile and places the rest one at a time in a spiral starting with a tile adjacent to the tile they are moving from. As the player can choose which tile they start placing them on, there are some tactics to this and I like how this movement stirs up the board and is on theme too. The different types of tiles are important as they can play a big part in a round. Crows on cemetery tiles score double points. Trash tiles (one per player) can be placed instead of a tile to displace an empty tile, plus crows stop their movement on them. Placing a shiny object on tree tiles with no crows gives the player a special ability tile which can be quite influential (e.g. one tile of crows doesn’t move that round, turn a tile into a cemetery for a round, etc.). The result is a simple game but with a great deal of tactical play. Not only is it about cunningly lining your shiny object up with crows, but it’s also about attracting crows that would otherwise benefit your opponents. (The easy, direct calculation of the potential scores make it easy for players to analyse ‘what if’ scenarios, but players should keep an eye out for anyone slowing the game by doing this too much.) Different to many games, you are not accruing anything between rounds (apart from the occasional special ability tile); however, not only is each round a fresh opportunity, but the rounds feel different as crows move and the game builds momentum as more crows enter play. The one element I was less keen on was randomly drawing tiles from a single pile as this can result in some players having a scoring advantage by drawing the more interesting tiles. Drawing lots of tree tiles with 0 or 1 crows on then it is harder to influence the scoring as much as players who draw more interesting tiles. This is an issue with Carcassonne too (when drawing lots of straight roads puts you at a disadvantage.) It doesn’t break the game or make it bad but some players who like to limit the luck element in games may find the occasional moment of luck will annoy them. In Crows, as the number of tile types are relatively few so, I think a good variant may be to give each player an identical set of tiles from which they draw randomly. 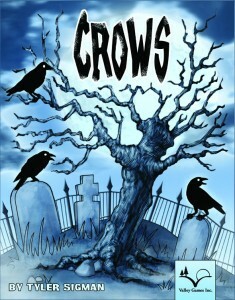 Overall, the negative items above are minor and Crows is a fun as well as a tactical game. It’s simple to learn but there are plenty of painful/entertaining choices to be made which is nice to see in a light and fast game. The different types of tiles are important as they can play a big part in a round. Shiny objects on cemetry tiles score double points. Each player starts with one trash tile which can be placed instead of a tile to displace an empty tile on the board, plus crows flying , they stop on the trash tile so it can interrupt their movement. Now we have played the game we would probably use them to greater effect.Placing a shiny object on some trees allow the player to take a special ability tile which can be quite influential (one tile of crows doesn’t move that round, turn a tile into a cemetry for a round, etc.). 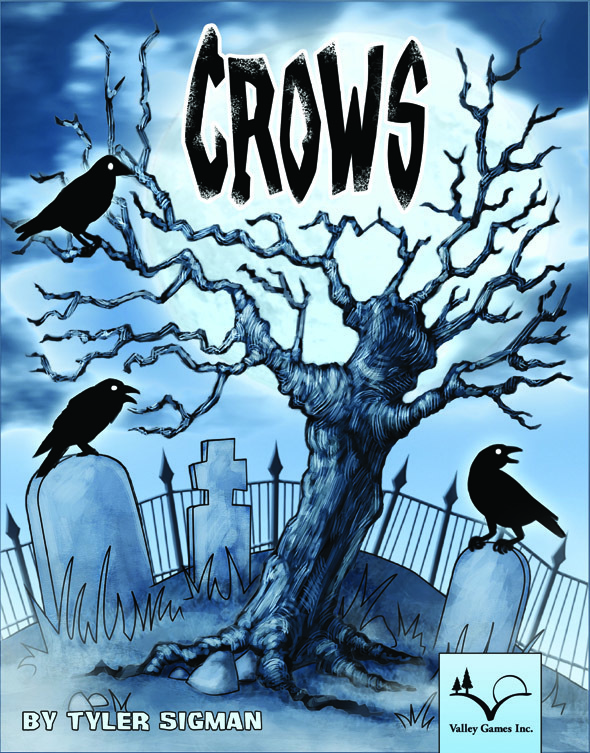 This entry was posted on Tuesday, January 25th, 2011 at 7:17 am	and is filed under Board Game Review, Board Games, Crows, Essen Spiel 10. You can follow any responses to this entry through the RSS 2.0 feed. You can leave a response, or trackback from your own site.